*"Life is too short to take gravely all the time. I want to delight in what I can when I can. Having this as my essential philosophy, my goal of art making is to create a positive and playful atmosphere, and generate warm feelings of intimacy and substance through my work." I first met Takashi Iwasaki a few years ago, back when my Inspired Stones were displayed at the Keepsakes Gallery in Winnipeg. His smile and talent caught my eye immediately. Tak had moved from Japan to study art at university in Canada. The fact that Tak had chosen to leave his country in pursuit of his passion and also to have to discover a new culture and country intrigued me. 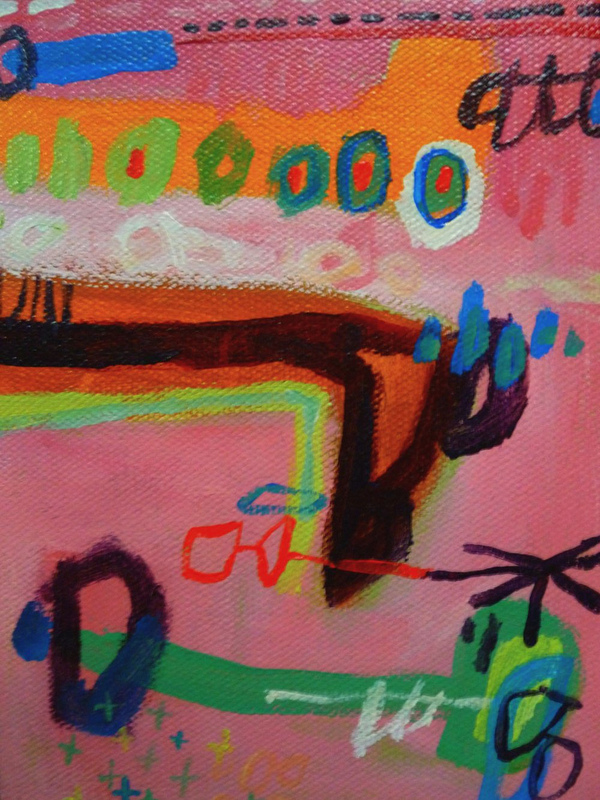 He had committed completely to developing his craft .Tak earned his Fine Arts degree in 2006 and has continued to tirelessly make his art and to be very involved in the Winnipeg art community. It's hard not to be affected by his joyous personality, which explains his heaps of friends and connections that have taken his amazing art to galleries all over North America. What type of art does he do, you ask? All sorts of wonderful things! 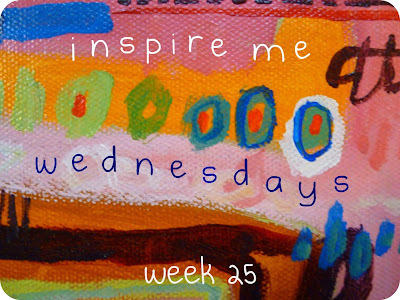 The painting detail that makes the background for this week's Inspire Me Wednesdaysis is from "Olibunbun", a paintings that we were fortunate enough to have purchased in his "early days". Tak's work is imaginative, whimsical and covers a wide range of mediums including acrylic painting, collage and embroidery. "Instead of writing, I document my life in a visual format. The things you see in my work are abstract and symbolic forms of the things I encountered with, thought about, and felt on a specific day or during a period of time. The abstraction of the images and combination of multiple words in multiple languages in the titles help me remember what the entries are about, while they do not provide clear information to the viewers, so they can interpret my work in their own ways. My little secrets – your source of free imagination." Please take time to visit and enjoy his website which displays his collages, embroidery and paintings. Takashi is also the director of the Semai Gallery, located in the basement corridor of 264 McDermot Avenue. 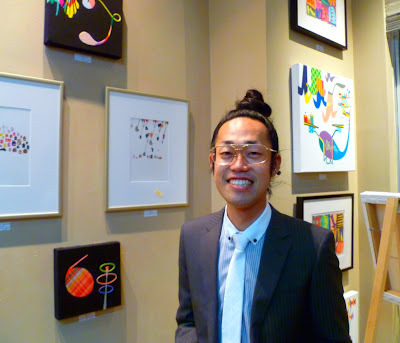 Takashi's art is shown all over the country, but locally you can find him at Gallery Lacrosse on Lilac Street. Thanks for your friendship and your great spirit Tak!